The awards keep pouring in for The Illustrated Courtroom and for CUNY Journalism Press for publishing it. The book has become one of the most-awarded books in recent years, receiving honors in categories as diverse as crime, history, independent publishing, academic publishing, and, of course, art. Some of the honors have come from Kirkus Reviews, the Eric Hoffer awards, the eLit awards, the IPPYs (from the independent book publishing association) and the Global eBook awards. See more here on the awards. The first book to really examine and celebrate the unique blend of art. 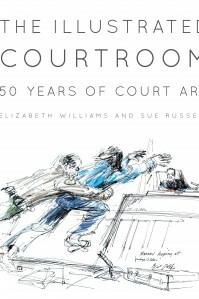 law and news in courtroom illustrations,The Illustrated Courtroom offers some of the best work of five award-winning artists covering a range of the biggest courtroom dramas of the last half-century. With a foreword by famed prosecuting attorney and crime novelist Linda Fairstein, the book is edited by renowned courtroom illustrator Elizabeth Williams, who has covered many headline-grabbing trials (Martha Stewart, John Gotti, John DeLorean, Bernard Madoff) for the Associated Press, every major network and many other news organizations. Narrative is supplied by crime journalist and author Sue Russell, whose work includes Lethal Intent, the acclaimed biography of executed serial killer Aileen Wuornos. The Illustrated Courtroom includes 140 iconic illustrations depicting memorable moments, and tells the stories behind the headlines, with the artists’ insider insights. The result is be an artists’ eye view of courtroom history in the making, allowing readers to savor the extraordinary work of those who go where cameras cannot. The book is a must-have for everyone passionate about true crime, legendary defendants, headline-making trials, big-time lawyers and courtroom drama. Readers meet an array of rogues, villains and victims, murderers and white-collar criminals, judges and legal eagles. Readers will step into dozens of colorful trials with defendants including Jack Ruby (who killed President John F. Kennedy assassin Lee Harvey Oswald), the Black Panthers, mob kingpin John Gotti, the Watergate burglars, key Iran-Contra players, Charles Manson, David “Son of Sam” Berkowitz, members of the Black Panther party, kidnapped heiress Patty Hearst, pop icon Michael Jackson, Mohammed Salameh, the terrorist behind the 1993 attack on the World Trade Center, and many more.